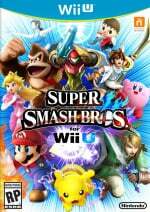 It should surprise no one that Super Smash Bros. on Wii U and Nintendo 3DS will feature an All-Star Mode, as it's been a staple of the series since Super Smash Bros. Melee. Masahiro Sakurai has now outlined how it'll work in the upcoming entries, focusing on the 3DS version. As before characters will appear in chronological order — based on their appearances in Japan — though the 3DS (and probably the Wii U) will utilise the second screen to give a visual history lesson. The bottom screen will also indicate whether the mode is full unlocked; you can see Sakurai-san's two latest Miiverse posts below. Pic of the day. 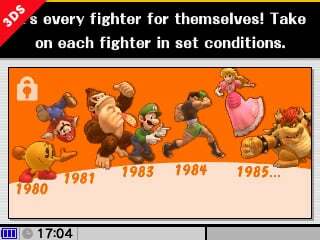 This time, you can challenge every fighter in All-Star Mode from the moment you turn on the game!! This is a survival battle with limited recovery items and no option to continue. However, this mode will be incomplete until you've unlocked every fighter... Until then, you can only play against characters that are already available. 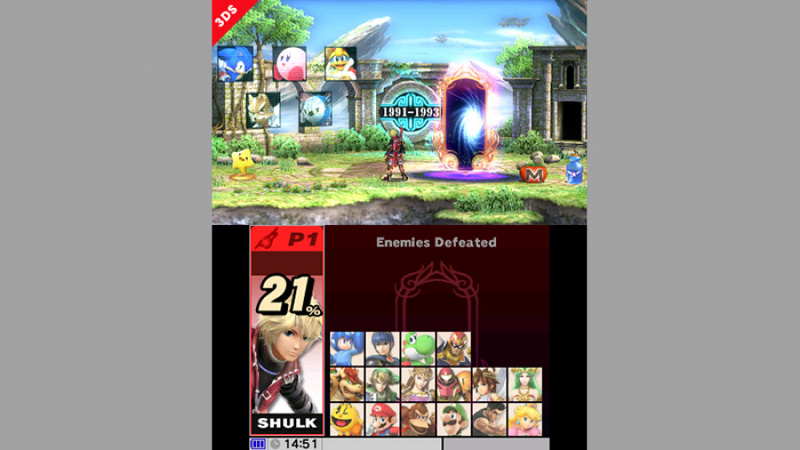 This is a picture of the bottom-screen menu, with a padlock indicating that the mode is still incomplete. Are you looking forward to All-Star Mode in the new games, and pleased with how it's shaping up on 3DS? Let us know in the comments below. im so torn on deciding if i want this game or not. every time they announce something else cool for it i want it, but i think i should save for pokemon, and maybe the new 3ds if theres a game that only works with the new one that i have to have. Whoa, you guys made this surprisingly quick. @Undead_terror I believe that these characters are all available at the start of the game. This picture confirms it is my guess XP. I love the way the rest area looks. I wonder if the recovery items you get are random this time, or you just don't get three Heart Containers. A Maxim Tomato, Fairy Bottle, and possibly a Heart Container? Interesting. I'm still not convinced this is the starting roster. Characters like Pac-Man and Mega Man are almost certainly unlockable, as well as a few others shown here. I think the starting roster will be the E3 demo characters. @Undead_terror Yeah I think you do unlock him like the other games, but only if the leak was completely true. Just one more amazing feature added to a game I was already decided on buying a long, long time ago. My hype keeps on growing! Glad I have this pre-ordered! I'm most likely going to be playing primarily as the Fire Emblem characters (especially Ike). I don't believe All-Star has ever been in chronological order. you can challenge every fighter in All-Star Mode from the moment you turn on the game!! I might actually get this on both Wii U and 3DS. @eviLaTtenDant I'm sure the first comment should be read as 'You can challenge every unlocked fighter from the moment you turn on the game'. @ueI Brawl's All-Star Mode did that. When counting series debuts anyway, not actual character debuts (which is why Ness was fought earlier, since the first Mother appeared in 1989, and Wario is fought later, since his own series didn't start until 1994). @eviLaTtenDant Probably Sakurai's sketchy English at play. What I think he means to say is that you can start the All-Star mode from the beginning, but you'll have to unlock characters to complete it. "though the 3DS (and probably the Wii U) "
I don't like that bracket. Like come on, why can't they just confirm or give some info on the Wii U version. This is getting pathetic. I actually really dislike All-Star having a set order of opponents, like in Brawl. It's cute that it is on chronological order, but to me it's pretty dull knowing who your opponents are before you play it, especially when you have to play the whole thing with each character to unlock trophies and stuff. I liked it better random, like in Melee. That's just me, though. In the American version of Smash, do you fight Shulk in a GameStop? So you're saying that Jumpman is a whole different mustachioed man in a cap and overalls? If we're going to split hairs, then DK shouldn't show up until 1994, since he's the current DK from DKC. But I wont play AS until I unlocked everyone. I dont see a point now to just battle the default unlocked characters. This is much more refined compared to the last All-Star Mode, considering that grouped characters by series in a rough chronilogical order. I like it! This is a pretty great idea. So hyped for this game. I am confused: So you can unlock every character one after another, but it gets harder the further you get? And when you die you have to start from the beginning, but can keep all the characters you unlocked thus far? Am I right? @Henmii No. All-Star Mode will available from the beginning, but you will only be able to fight the characters you have unlocked. The padlock won't go away until you have unlocked every character. There are indeed no continues. @LtAldoRaine Meh... you want random? Classic mode is for you. @RaphaBoss Eh, it ain't the same thing, in Classic you fight 12 enemies or so (unless they changed it up on this one) and All-Star you fight every single character in the game, it's kind of the ultimate challenge on harder difficulties. And to me, who tries to get at least all the character trophies in the game, having always a set order makes things get tiring much faster. To each its own, I guess. @LtAldoRaine I understand how you feel, but if it was random, it would kill the joy of seeing the evolution of video games.